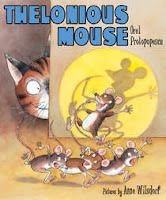 I am always a sucker for an impish rodent, so Thelonious had me from the cover. His hipster cool cat ways and his need for tip tappin' feet and throwing out words rolling like beats, offers the ideal model for the writing trait of Sentence Fluency. "Will sly mouse live to sing alonious? Thats the twist in this tale of Thelonious!" Two thumbs up for the beautiful and unique illustrations. Did Anne paint on newspaper? I am loving this faint appearance of newsprint in places like the cat's paws and the mouse's tail. Several really creative collage techniques embellish the full-bleeds, double-page and single page spreads. I really appreciate how the art work supports the movement of the text, starting with the floating music notes on the title page, and appearing throughout, with cat snacks bouncing, and furniture being knocked over. An effective pairing of words and images, and a book that is fun to reread, making it a helpful tool in building reading fluency. The beatnik vibe of this read aloud could earn it's place in a poetry study or an introduction to jazz, rock, and blues.